If you ask me what I love, travelling will always be one of the first things I’ll mention. I’ve always loved it, and times have changed, but my love for travelling has never faded away. Now it’s become even easier than ever to travel since my Blumil electric wheelchair gives me more freedom with how practical and functional it is. It hasn’t always been like that. I took my first vacation since the accident back in June 2003. I chose Egypt for my first destination and hoped that I’d made a right choice. I visited no other city than Hurghada, the second biggest Egyptian city located on the Red Sea coast. It is a famous tourist centre, and rightfully so. Since I came there I had absolutely no time to be bored. There was always something exciting waiting for me if I only said yes. I said “yes” to many things that summer. I was swimming in the sea, and enjoying the perfectly blue sea I had in front of me. 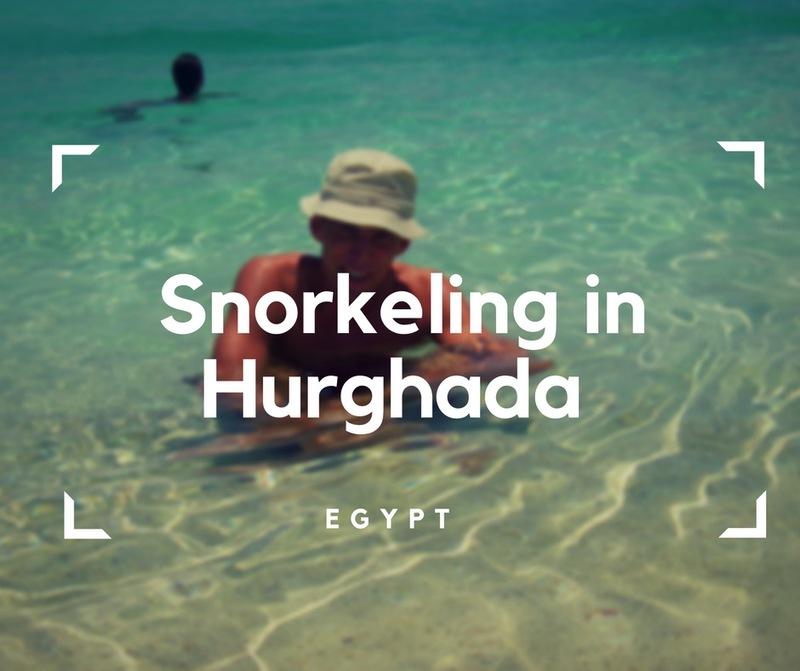 I went snorkeling and boating, and when I thought Hurghada would not surprise me anymore, it did. The abundance of excursions offered by resorts was outstanding. 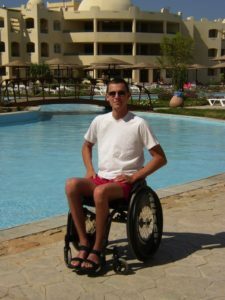 A variety of available activities and general accessibility for manual and electric wheelchair users are two different stories, though, and the latter one can make or break even the most wonderful place. 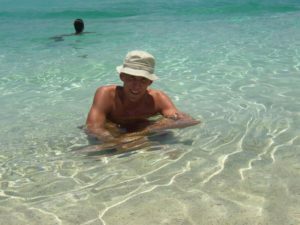 I want to share my experience with you and show you Hurghada the way I saw it back in 2003. 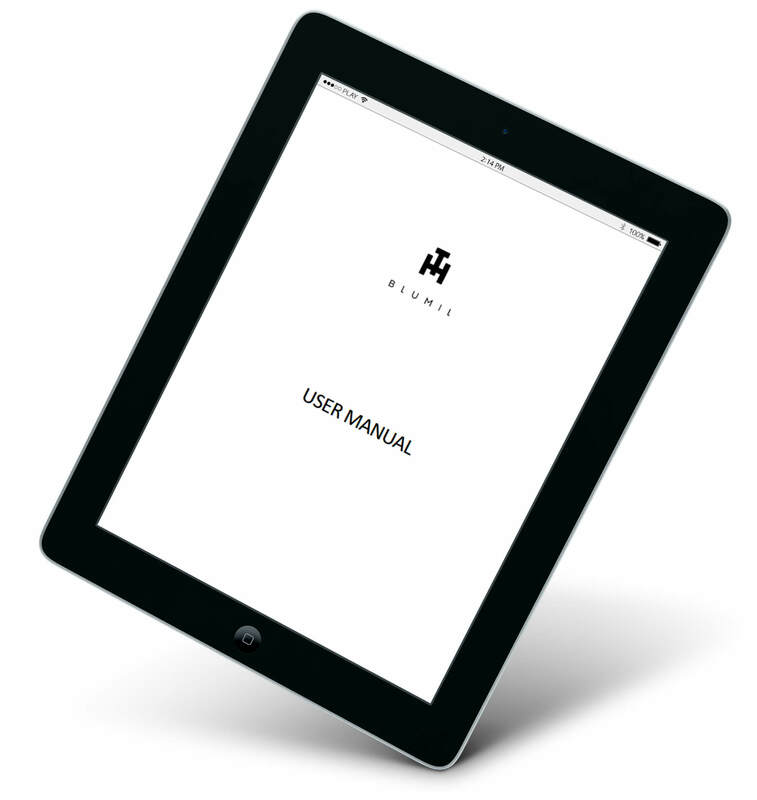 3,2,1… Here we go! One of the most fun things I did in Hurghada! The sensation of being underwater alone is something thrilling, but the abundance of colours you will witness there can take your breath away. The sea life’s vibrant and busy, and it’s wonderful to be able to observe it. I definitely loved the experience, and can’t do anything but recommend it to everyone. Hurghada, with its clear, turquoise waters and warm climate, is a snorkeler’s paradise. I’ve always liked boats. There’s something calming in the sea, and getting away from the land for a moment is refreshing. Hurghada’s beautiful sea and nice beaches make a great view, and let me tell you, a sunset seen from a boat is absolutely stunning. There are many companies in Hurghada, which are more than willing to help you start your boating adventure, so it’s definitely a good place to fall in love with the sea. I just wish I had my Blumil electric wheelchair with me, to enjoy the boat on a more stable device! To be honest, I didn’t go to many excursions, since I prefer snorkeling to visiting museums, but for those willing to get a taste of long Egyptian history, there are plenty of private tours. The city of Hurghada itself is interesting since there are two important buildings there: the Big Mosque and Coptic Church of St Mary. It’s the contact point of two religions, and a nice sample of Egyptian diversity. As Cairo’s not too far away from Hurghada, you can also go on a day trip there, and visit Giza Pyramids, Sphinx and Egyptian Museum all in the same day. Hurghada’s a pretty international place, so you can stumble upon restaurants with cuisine from all over the world. The city’s also abundant in seafood of all kinds, so if it is what you like, you can enjoy fresh fish, mussels and shrimps as much as you want. Of course, you can also try Egyptian cuisine. It’s much more than Falafel – balls of chickpeas that have been deep fried – or Hummus, but I haven’t really indulged too much into it, so I can’t really recommend you any specific dishes. To be honest, as much as it’s interesting, it can be too heavy for your stomach if you’re not used to it. Sometimes it can be your worst nightmare, if you’re attacked by the culinary Pharaoh’s Revenge, and trust me… you don’t want that to happen. As Hurghada’s a place full of resorts… and sometimes it’s just enough to lay by the pool and relax drinking a wonderfully cold cocktail. If you want to unwind and charge your batteries, you will probably like Hurghada a lot. Resorts offer many attractions within their own walls, so going to Casino, enjoying a day at the spa or watching local performances without leaving actually leaving your hotel is possible. 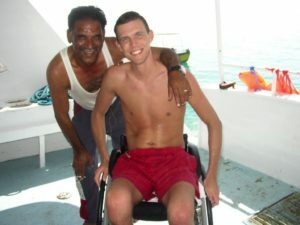 Back in 2003, it wasn’t easy to find an accessible hotel in Egypt. 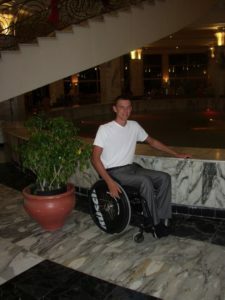 What’s more, even hotels, which claimed to be accessible, often turned out to be anything but wheelchair users’ friendly – and having an electric wheelchair didn’t improve the situation. One of the problems I had there involved bathroom doors. They were so narrow that entering a bathroom was an absolute nightmare. For that reason, I couldn’t give them more than 5 of 10 stars, and I am probably being quite generous now. Egyptian attractions are generally wonderful, but their accessibility is a different thing. Most of the attractions are not well adapted to wheelchair users’ needs. For that reasons, they also don’t deserve for more than 5 out of 10 stars. I have read a lot about them, but I didn’t really go sightseeing much when I was in Egypt, to be honest. I’ve seen a few attractions, but not too many. I had my doubts about accessibility and crowds being everywhere, so I decided to go snorkeling instead. Unfortunately Egipt’s accessiblity cannot match Thailand. One of the greatest disappointment in Hurghada. Stairs are everywhere, and ramps are mostly nowhere to be found. Accessing many restaurants is simply out of question. As much as people are nice and willing to help, they often require quite a generous tip for doing so. 4/10, no higher score’s possible. Even having Blumil electric wheelchair wouldn’t have helped! Curbsides are definitely too high, and the surface of streets is often very uneven. To be honest, I didn’t feel safe at all when I was out in Egypt. Every move could be fatal, and nothing about streets and pavements seemed friendly to wheelchair users. Navigating in the country full of uneven is challenging, but there are 100 more fun ways to challenge yourself, so Egypt won’t get many points for that. 4 points out of 10 is all these pavements deserve. 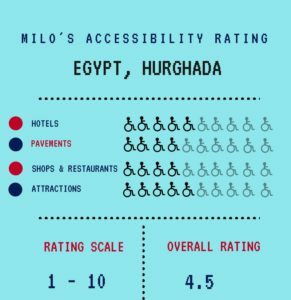 As you see, as much as I liked Egypt as a country, there is still a lot to do with its accessibility to wheelchair users. Amazing views, wonderful attractions and good atmosphere will always lose a lot of their charms if they are accompanied by terrible pavements, inaccessible hotels and restaurants with no ramps. Egypt has a lot of potential to be wonderful, provided it will finally become more accessible. Nothing less, nothing more.